For over 2 decades this secret valley has my destination of retreat, and can be located a mere 15 minute walk through some pine reforestation on the outskirts of Hillsdale where I live. I enter it very respectfully, being fully aware it is in the hands of private ownership. Being extremely careful not to leave any trace of my presence, I will exit a slightly different route than I entered. Throughout the different seasons, the places I enter and exit will vary, lest a trail will start to develop, which would draw attention to my intrusion. Always very calming entering My Secret Valley! For over 22 years I have come here, ever since my wife and I moved to Hillsdale, and when my oldest, who is going on 23, was a baby. This valley has been my place of retreat, a refuge, from the daily churn of hidebound life. In a world that is constantly changing, the seasonal rhythms in my secret valley do not change. In the springtime, there is the vivid greens of the bursting buds of the maples. The forest floor is grandiosely carpeted by the delicate, and exquisitely beautiful white trillium. The forest becomes an air conditioned retreat on a hot summer day. Particularly after a rain, I loved that piquant, musky “earth smell” emanating the air, and stimulating my olfactory senses. A transformation takes place in the fall, as the leaves burst forth into vivid oranges, reds and yellows, before falling to a leafy death, that ushers in winter. The cool sereneness of winter. In winter the trees majestically stand bare naked. Appearing to be dead and lifeless, they wait, holding life in their silent presence, until once again in that seasonal rhythm, the bursting buds will again break forth. Beautiful, exquisite carpet of white trilliums. In my secret valley, I would often sit down and lean my back against the majestic giants of the forest. There was strength just being in their presence, trees that have grown tall and strong through the ravages of storms. After 22 years these trees were my friend. The fertile, rich earth at their base has soaked up many tears over the years, when life becomes overwhelming, when I fail as a husband or a father, when I grieve the death of a loved one. Those majestic trees have “listened in” on many prayers, as I pray for others, or need direction in my own life. As I sometimes lean against these giant maples in silence, it was if these tress were holding me, as if through that “embrace”. After I would say goodbye and return back to my stresses and routines, I would return refreshed and renewed. A few of those straight, tall trees, that I used to sit under. I was several weeks away from my secret valley this past fall due to an ankle injury, but knew it was very important to allow this injury to heal. When I eventually returned in early November, my heart was devastated. The forest that had been my refuge for the past 22 years, and had never changed, had been forested. The giants that had soaked up my tears, listened to my prayers, and “embraced” me, leaving me strengthened and renewed had been cut down. I followed the “trails” of the massive maple trunks that provided many a support for my back over the years. The trails were easy to follow because of the deep ruts left by the bush machines, until I came to a clearing. It was here the trees would have been loaded onto a lumber truck. It was my way of saying a final thank you goodbye. The treetop branches, that once provided oxygen for my lungs, and air conditioning on a hot, humid day, lay right where the tree landed, after filtering and giving out it’s final breath of oxygen. 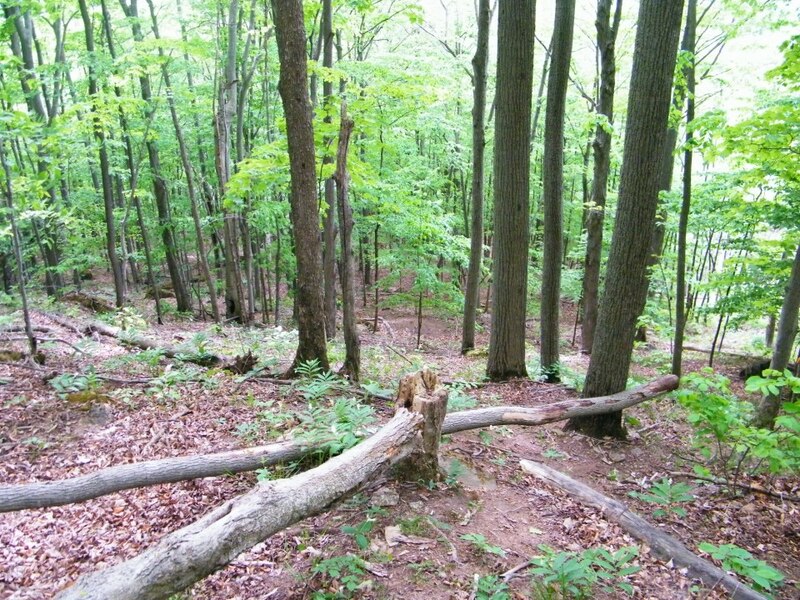 A recent walk to my secret valley, the treetops of the fallen hardwoods are littering the forest floor. The trunks of these once majestic trees, would end up at a sawmill, and end up for human use and enjoyment. The reality is that I eat off of a table made of wood, which comes from a tree. I wrote my rough draft of this blog on sheets of paper, which comes from a tree. We ALL use and enjoy products made of trees. Another picture of the treetops. 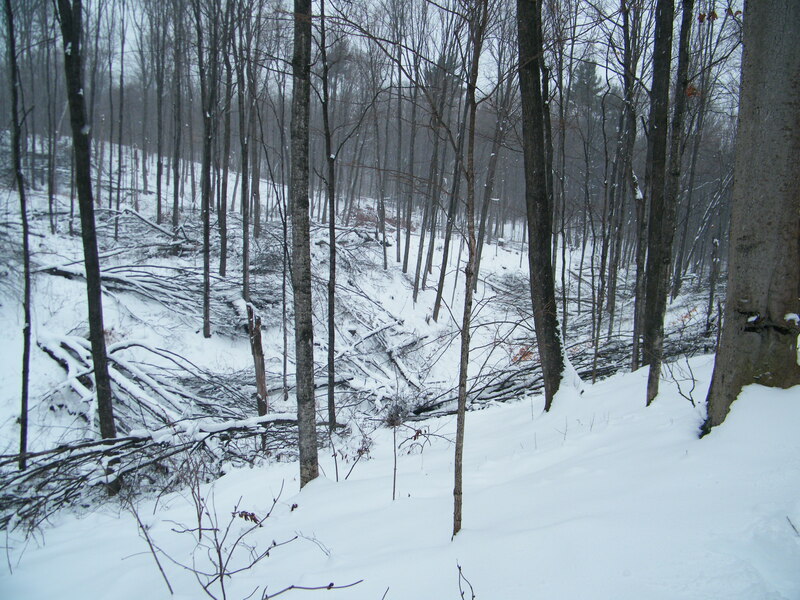 My secret valley at one time was part of a vast forested wilderness. 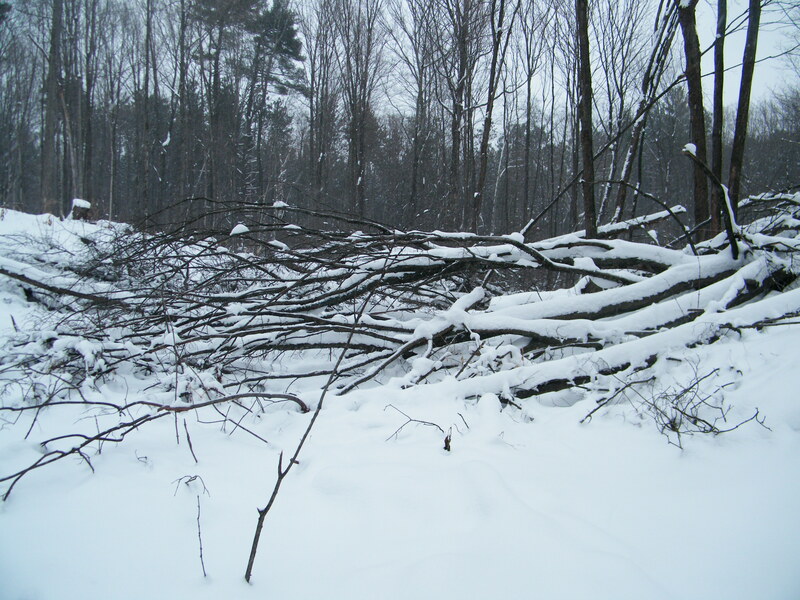 European settlers arrived, and for the most part clear cut the vast forests, leaving small pockets like my secret valley. Some of this cleared land has continued to be farmed as agriculture to this day, but much of the land around where I live proved to be too sandy, and ended up being replanted as pine reforestation. 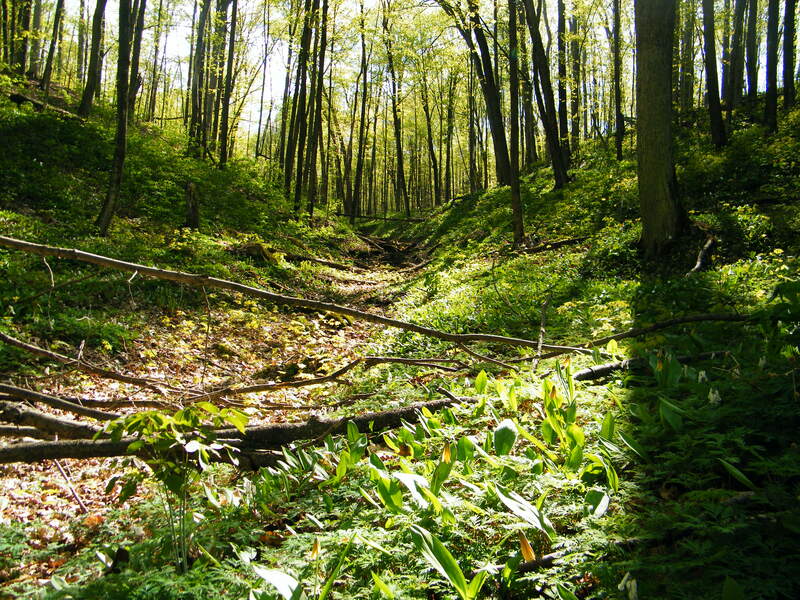 The diversity of this original hardwood forest ecosystem has been forever lost. Despite my sadness of the loss of the giant trees in my secret valley, I realize they were harvested using sustainable woodland management techniques. Younger trees will now have more room to grow, they will some day become the future giants. The forest will eventually heal of it’s scars and wounds, the ruts will fill in, and the tree top branches, now a lifeless grave lying on the forest floor will provide enrichment for the soil. The diversity of this beautiful ecosystem will continue. Despite all we know about the irreversible damage done by clear cutting, it continues around the globe at an unprecedented rate. With the goal of making big profits, and keeping shareholders happy, corporate forestry giants are destroying through clear-cutting virgin forests, all for short term gain. Profits are made, because of our insatiable demand for wood and wood products. In this article called Global Deforestation, it mentions that “about half the forests that once covered the Earth are gone. 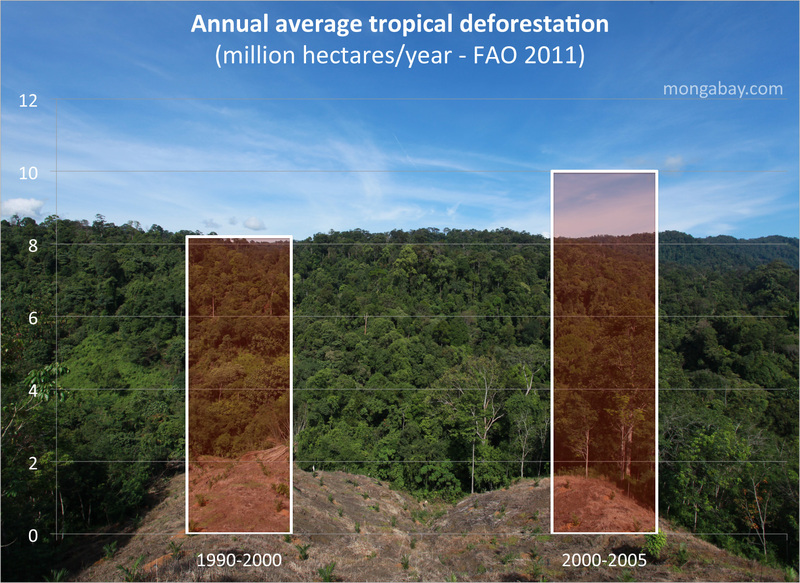 Each year another 16 million hectares disappear” (10 million hectares of those are tropical rainforests). Each year global deforestation is increasing. Canada’s Boreal Forest, is one of the largest intact eco-systems left on our planet. In this link called Boreal Canada, it mentions “our forests store 208 billion tonnes of carbon. Naturally occurring eco-system services provided by the Boreal, such as carbon storage and water filtration are worth 2.5 times more than the value of extracting resources such as minerals and timber”. Yet more and more, it is becoming an eco-system in crisis. According to Greenpeace, only 8% of “Canada’s remaining intact forest is protected by legislation”. 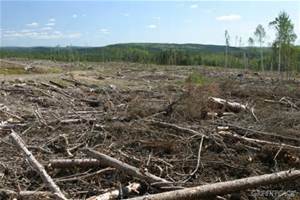 Clear-cutting of Canada’s virgin boreal forest. So what can we do? What can I do? How can I make a difference? 1. Reduce. Reuse. Recycle. Do I really need that new dining room table? 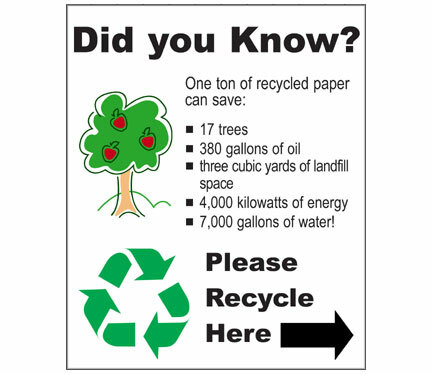 When we recycle our paper, not only are we saving trees, water pollution is lessened by 35%, and air pollution by 74% through the remanufacturing process. Saves 17 tees, 380 gallons of oil, 3 cubic yards of landfill, 4,000 kw. of electricity, 7, 000 gallons of water. 2. Buy FSC (Forest Stewardship Council) approved products. This international regulatory body puts it’s slogan on products from manufacturers that obtains it’s wood from properly managed forests and not our virgin ancient forests. Look for the FSC symbol when purchasing wood and paper products. 3. Plant a tree. We may not see dividends in our lifetime, but it is like a “pay forward” for future generations. Particularly in light of all the natural resources we have taken from the earth over the past few generations. 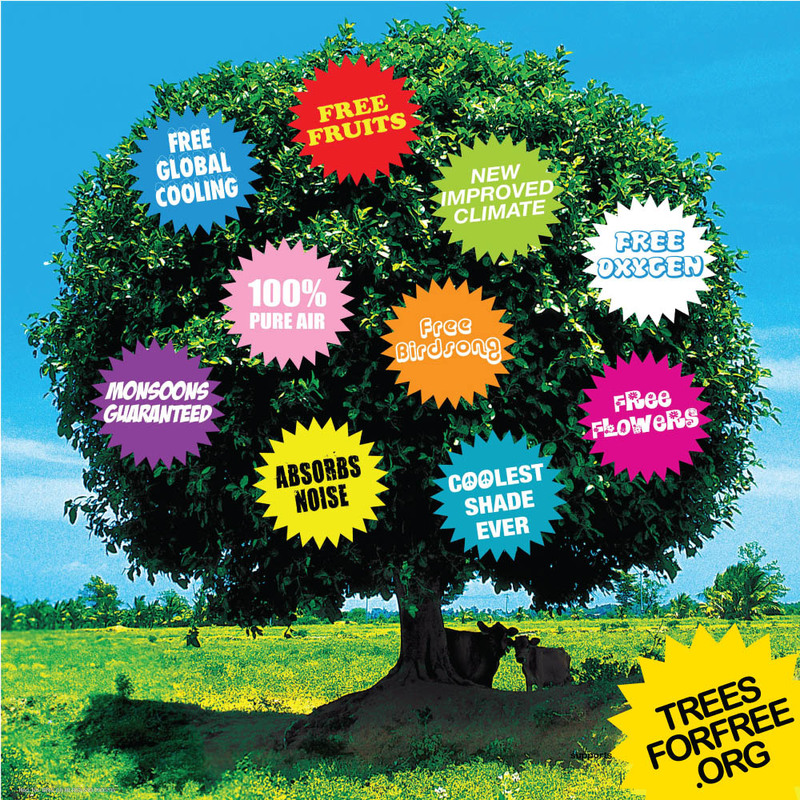 This link gives you Ten Reasons Living Trees are Valuable. Thank you for taking the time for reading another long blog. Hoping you, and our future generations will always have that “Secret Valley” to go to, where our minds and spirits can become refreshed and renewed. I am sorry to hear that your own special haven which you were so careful to preserve has been forever changed. The pictures sadden me. I felt this post is a bit different from your other posts. Its just my feeling. I felt your emotion through your words. I was asking you to invite me to your secret valley but soon I realized the sad thing happened to it. 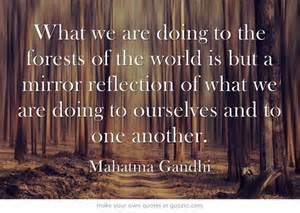 I do realize the importance of recycling and planting new trees. Trablog, you are very perceptive my friend. I was thinking of doing a post last fall, after the marathon, to invite you all to “my secret valley.” Would have taken some fall colour pictures to add. I never made it there with the injury, and when I did make it, the forest of course had changed. The post did take a definite change of direction. Environmental issues has always been dear to my heart, and I know I should be doing way, way more. Sharing the emotions in this post hopefully will raise a tiny bit of awareness, at least in this little blogging circle…haha. Hoping it did not sound like a rant. Sometimes when emotions are involved, I feel sometimes it might come out that way. I can imagine how sad it must be to you from the way you have written it. I felt the post was different not because you dealt with an environmental issue. There is a lot of emotions in your words. I felt it came right from your heart. Thank you so much Trablogger. You are a wonderful friend!! How sad to learn what happened to your secret valley. You shared also very serious and concerning information. Thank you so much Lucile for taking the time to read and comment. Deforestation is a global concern. I am amazed how many countries represented in this blogging circle. And thanks for the compliments to Holland. I’m a citizen of Brazil as well, and I’m afraid I’m more concerned about ilegal deforestation in the Amazon forest…. Thank You Lucile. I really would love to get to Brazil and the Amazon basin, to visit the rainforest 1st hand and support the local rainforest tourism initiatives. My support would help the local economies, and help prove the rainforest is of FAR more value remaining as a forest, and now mowed down for short term gain. Carl, I love your post and how connected you are with that land and those trees. You will have the next few decades to watch those sapplings mature into the trees that will perhaps comfort the future you. I have carried a card around with me for years and finally turned it into a magnent (repurposed an old magnetic strip) that sits on the refrigerator. It reads: “Advice from a tree: Stand tall and proud. Sink your roots into the earth. Be content with your natural beauty. Go out on a limb. Drink plenty of water. Remember your roots. Enjoy the view!”. I love this quote. I think Trees are like old souls providing for us with their wisdom. Thanks for sharing your story, it was beautifully written. That’s heartbreaking, even if they did cut those old trees responsibly. Thank you Fleck for your understanding and caring comment. With you in a sense coming from, “my neck of the woods” (comparing to the world scale), I am sure you have been in these hardwood cathedrals in Southern and Central Ontario, that are survivors from the early settlers. It is so comforting having a destination or a sanctuary. Glad you have and appreciate yours, Carl! Thank you so much for appreciating my sanctuary. It means so much to me that you have taken the time to read and comment. I felt every word of this post. Nature is my sanctuary and my church. I’m sorry to see the change to yours in the name of “progress”. Thank you so much Karen for reading and your very understanding comment. I identify with you so much, there is nothing more restorative to body, spirit and soul than immersing oneself in nature. My ever so dear #1 and #2 commentators, you dearest CC et al, and dearest Trablog. You 2 are so very perceptive, and can see when I peel away a mask over something that is deep and personal. Thank for feeling and experiencing my emotions. What a beautiful friend you are. I do remember a post you (Trinity and Chanel) wrote about trees called “when trees cry” and the strong symbols trees on your beautiful inner system. I commented about this and Chanel very graciously shared regarding the ambivalence from the inside to the outside. It was mentioned, “There is a favourite tree for all of you in front of your house”. Trees are so comforting and restoring.. Living trees are so powerful, healing and therapeutic. You can’t put money on that value.Their value goes FAR beyond providing shade, filtering the air, and storing carbon. Yes, you will. To share new memories and hurts and your prayers. I thought of that same post actually while reading this. The same tone, beauty, reverence, and sadness. Trablog is a beautiful person. So happy to have met him through you. I’ll keep running along with you dear friend. Just remember I am younger but slower. Lol! Thanks Carl. A super article about Trees and Life. I was reading your story thinking what a beautiful thing you have going with this secret valley – you’re lucky to have each other! Then came the shock of knowing it will no longer be that way. I felt for you and for the forest. I love getting out in the mountains to go hiking, so the thought of that being taken away is saddening. Some people just say there’s nothing they can do about global problems like deforestation, but if everyone does their bit then as a community we can make a difference. Thank you for this reality check – I will try harder too! Your vivid description of your secret valley brought me peace and tranquility before the hustle and bustle of a busy day. Your words brought back great memories of me as a teen in PEI. Coming home after a long days work on the farm. I would lay on a small hill and stare at the stars and I swear that I could see every star in the sky! You know, the only interruption I’d have is the feeling of a cold nose nudging my arm because I’d gotten lost in my thoughts and stopped petting Cody my Golden Retriever. You are very welcome Devan. And WOW…..Devan, I used to do that after a long days work on the farm where I grew up as well. No hill, instead it was behind the barn with our farm being only 12 miles from here. Not as bright and vivid nowadays because of light pollution from neighbouring cities, but as a child the stars were so brilliant. I LOVED reading this Devan. You really are a excellent writer. I felt like I was laying on that hill in PEI staring at the stars lost in my thoughts. Oh wow. All the layers here. So sorry for the deep, personal loss it is to you, Carl. I so appreciate your being able to look on with hope (seeing the forest, not just the trees). =) Sad, beautiful, bright post. Diana, thank you for taking the time to stop by to read, and for sharing your words of support and encouragement. The pictures are magical and it disheartening to see that it’s face is going to changed forever. To see your positivity about the diversity being restored gives a reminder as how important it is to seek out the silver lining. Always. In India, we do not really have strong communities that get together to stop deforestation. Too much politics. This has given me the nudge to find out at least the status in my city. Thank you Prajakta for your support and solidarity. Unfortunately politic issues seems to be everywhere, in Canada the issues might be a bit different, than in India. Here, the forestry, mining and petroleum corporations are getting very big and powerful, they have a lot of pull. The government sees tax revenue and employment from these short term projects, and the companies are given the go ahead, but at what cost. Carl, what a powerful and I must say sad read, “My Secret Valley”. What a shock and devastating experience to find your secret valley destroyed. A global epidemic of destruction, and yes, we can rationalize this by saying, “the need for products”. But, the way in which our planet is ravaged, is somewhat despicable. Yes, hopefully everything will come full circle with time. This is a wonderful post addressing environmental issues, along with what we can do to help to make a difference. Thank you! Pepperanne, the words in your response are written SO passionately. This really means so much. We live in a very materialistic society. Hopefully in time, lifestyles will become simpler, to ease the pressure on our natural resources, and there won’t be as much “need for products”. You are a wonderful person Pepperanne. Such a beautiful post, Carl. Sadly, this is the story with so many ‘secret valleys’. Thank you for taking the time to write about it and make us aware of the beauty that you see there. So true Ashley. Even in this area not far from here there are a lot of “secret valleys” that have changed. Valleys I used to hike as a teenager are now carved out for million dollar homes. It is happening all over the world. In France I had a park, or national forest just up the road. Most weekends I either ran or bike in it. In the summer I spent many early evenings bike the trails as I wasn’t teaching. Anytime of year I’d happily be there. I didn’t like it in summer it part of it was taken over by a camp site or the people that descended it for picnics. Where were they when the weather wasn’t so nice? It felt like my sanctuary had been taken away. As for recycling, I’m kinda strict. We recycle, donate, reuse as much as we can. Luckily in Barcelona, most streets have 5 large recycle bins: paper, plastic and metal, glass, organic and one for everything else. They have a van that parks up once week at designated location for people to drop off light bulbs, electrical items to recycle and once week your’e allowed to put out unwanted furniture for recycling. That’s not to say everyone does or it goes well! Paper I always try to to buy recycled or from sustainable forests. Thank you Natalie for taking the time to read and for your wonderful comment. It is really neat to see how Barcelona, and a lot of Western Europe cities are being very proactive in their recycling programs, which eases the strain on our natural resources including our forests. Thank you for sharing about the national forest park in France. I can understand those times when it no longer became a personal sanctuary for you. Is there anything similar in Barcelona, or would that secluded beach often shown from your gorgeous running photos be your place of retreat? Apologies for not replying sooner! I think Europe is more proactive than North America. What surprises me however is that France and Spain seem more advanced with recycling than the UK. They have recycle options, but you can’t recycle every type of plastic and much goes to landfill. Here we put everything in the yellow bins and they sort it out. No idea if they recycle or what! We also have a 5c/p charge for plastics bags, but only in supermarkets. As for my sanctuary, I have the zoo. A little odd for a vegan, some animals I feel for, but they are making huge renovations at the moment. I like to go an hour or 2 before closing during the week. Hardly anyone is there, even in the summer and I get my nature fix! Thank you so much Natalie for your reply, and you are definitely correct. Europe is WAY more proactive than North America when it comes to recycling. The diversion from the waste stream is improving here, but has such a long way to go. Oh, sad, sad, sad!!! I’m so sorry this happened to you!!! My husband’s family has a long standing tradition of being tree farmers, so I know this scenario well. Every 30 years, they cut the the timber and plant new ones. It’s worked out really well for the family budget, but as one that doesn’t own the property, you had no idea that this was coming, and as your sanctuary, that was quite a blow!!! 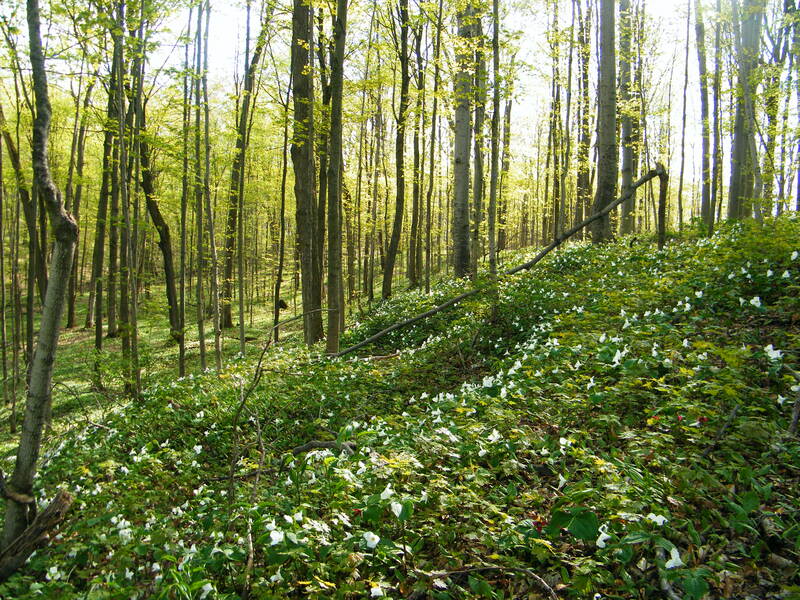 I hope that spring will bring a time of great growth and planting for your forrest!! Thank you April for your caring words of sympathy, and your supportive words of encouragement. I appreciate the fact that your husband’s family replants new trees to replace the trees that were harvested. Does not always happen elsewhere, so I appreciate this. Oh yeah. Deforestation is a different matter. Our tree farms are loved by their owners. They are always replaced. Alan’s dad is a forester, so trees are his passion. 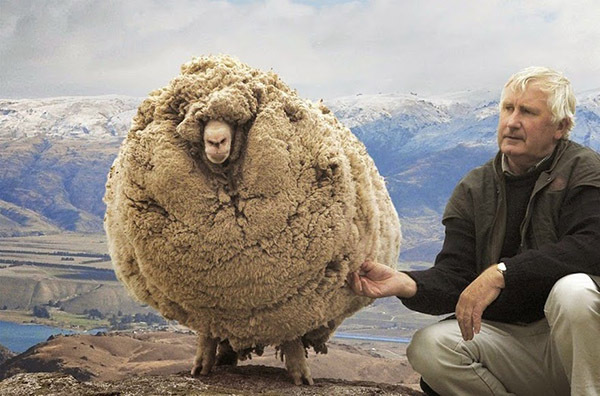 I am sorry for the loss of your secret valley Carl. I truly hope that it regrows in vivid splendour so that someone else may find it and enjoy its cool embrace at some time in the future. Carl, I can’t remember if I’ve already commented on this post or not, but my class does an entire unit called Trees during the last segment of our school year. The pictures and lesson here is wonderful. I’d love to use the pictures and even a simplified version of the story for my unit if that’s okay. And your solutions! Just let me know what you think! So sad to hear of the changes to your beautiful secret valley. Thank you for stopping in to read Sue, and sharing your words of empathy. It is appreciated! Secret Forest Valley. The Trees are crying. It is so important that we finally wake up and do something. Thank you for this beautiful and eye opening post! Thank you for the wonderful post. I too sit in the woods as much as I can. I’m sorry for the temporary disfigurement of your secret valley. I used to log, and am saddened by most of the practices out there. Peace to you, and if you see foot prints on your hidden trail, fear not. It’s not the owner of the property, it’s just me. Rusty, thank you so much for dropping by to read and sharing your wonderful comment. So wonderful to “meet”” you in the blogging world, and how wonderful to find, that in this fast paced world we live in, you too seek solace in the woods, as much as you can. Have already been over to your blog for a quick look and follow. Jason, from OM is always so great to make connections. Jeanine, thank you so much for such a wonderful comment. I SOO much appreciate that your family practiced sustainable forestry, and you, yourself worked at replanting. My dad was not a logger, but was a farmer (supported us by growing crops), who also deeply respected the land. He never used pesticides or herbicides, rotated his crops, and each year set aside a couple off his fields to allow it to fallow or rest. Have only been in the old growth forests of British Columbia once about 25 years ago. Have never forget that magical experience. Aww, very precious to have these heritages and legacies. Have always wanted to get into farming, but that is okay. I am fortunate to live in a very small community where there are woods and forests nearby. Wow, Kevin, thank you so much for stopping in read, and sharing this heart warming comment. Having woodlands to walk in, is such a gift, so glad you have had that time with your grandfather. I love the sounds of acorns falling in the stillness of the woods. I’m so sorry you lost your beautiful secret valley. It pains my heart so see such devastation in nature. Thank you for this beautiful and informative post. That’s a lovely perspective on things. Your positive energy will move mountains!